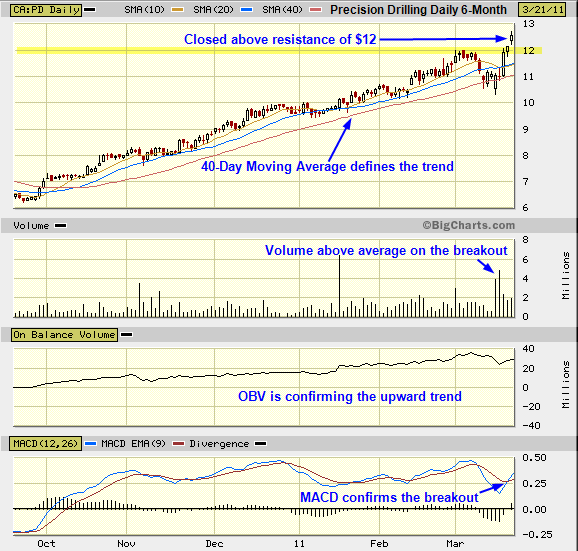 Can Precision Drilling (PD) hold the new support level of $12? The major trend, intermediate trend and near-term trend are all up. The 40 day moving average is a good approximation of the trend line. Always trade in the direction of the trend. There was a breakout above resistance of $12. Major support is now $12. The reversal of resistance to support is an important principle in technical analysis. The breakout was on above average volume. Trading volume measures the force behind the move. On balance volume is confirming the upward trend. The MACD confirmed the breakout. If an online trader made a buy on the breakout at $12.50, the trader must set up a stop-loss at that time. A reasonable stop-loss would be below support at $12. A stop-loss of $11.87 would represent a loss of around 5% and maybe not close enough that it would be taken out on a light test of support. Anyway, you will be around to trade another day. Risk management is an important concept in online trading. Preservation of capital is rule #1. Precision Drilling is a leading provider of oilfield services. Other stocks analyzed on this site include: Encana, Suncor, RioCan, BMO, Shoppers Drug Mart, Pfizer, BCE and Patriot Coal. Investors are seeking yield. RioCan has been a favorite with institutional and individual Canadian investors. This entry was posted in Stocks and tagged breakout, candlestick charts, MACD, OBV, Precision Drilling, resistance, Technical Analysis, trend on March 21, 2011 by Trader.